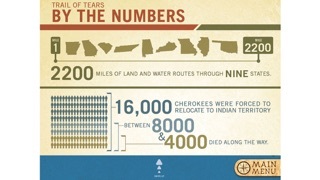 Trail of Tears is a history app that is full of great information, pictures, and timelines that reviews the events affecting various Indian tribes from 1815-1860. 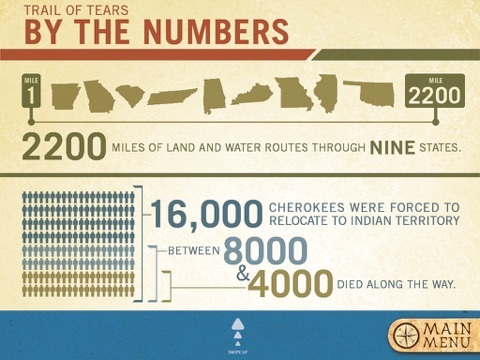 Trail of Tears is a highly educational, history app that focuses on a time when various Indian tribes were forced to move out of their homelands into other areas due to new laws and encroachment on their land. 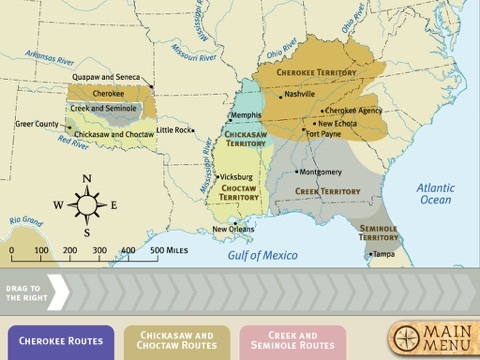 This app takes a look at the some of the major events including the First Seminole War and the Indian Removal Act as well as a variety of other important moments in time between 1815 and 1860. This app is full of great information and would be perfect for children to use as additional study to what they learn in school. 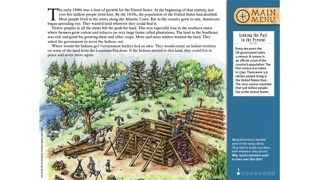 This app is full of great pictures, timelines, a map, and tons of information for children to learn. 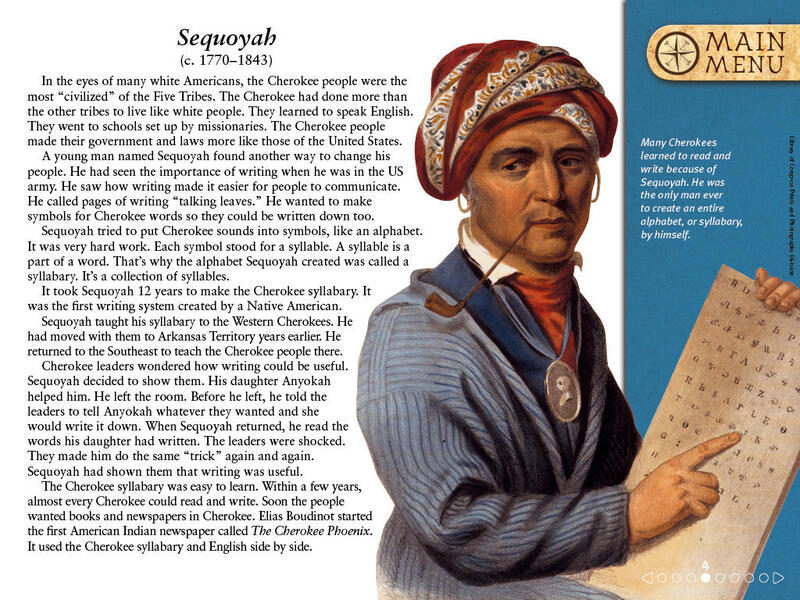 The set-up is fairly simple with pages the swipe from side-to-side, and a main menu with six sections to explore. 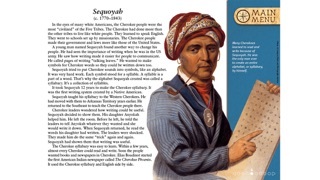 The organization of the information makes it fairly easy to move through. With that said, unfortunately there is not an option for narration to assist children as they move through the app which limits the app to children who are comfortable reading on their own. The app also does not include any sound effects or music which can be a little disappointing for children. There is no doubt that this app is full of information for children to learn. 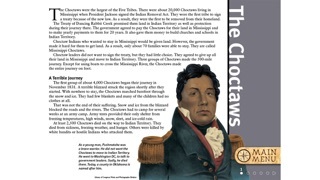 Not only are there six sections of material including a timeline of events, a map, and statistical information, but there are several pages of information on the main Indian tribes that were affected during the highlighted events. There is a great deal of information to read through and learn and since the developers have broken it down into various sections, children can take each one at a time. This method of set-up makes it a good app to use in the classroom as it is a quiet self-study type app. Priced at just under a dollar this app is an absolute steal! With the amount of information that is included in this app and the graphics, map, and timeline that are included this is a great deal. 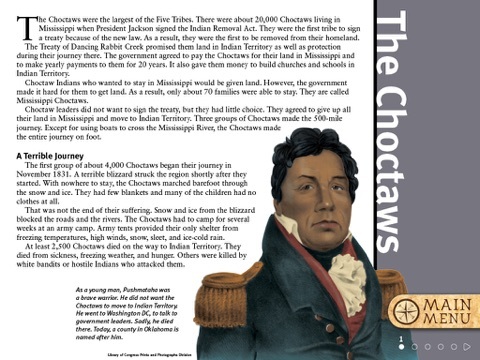 Parents who are looking for some additional ways to help children with their history lessons or teachers looking for tools to use in the classroom. While this app is simple to use for school aged children, it isn’t terribly engaging. 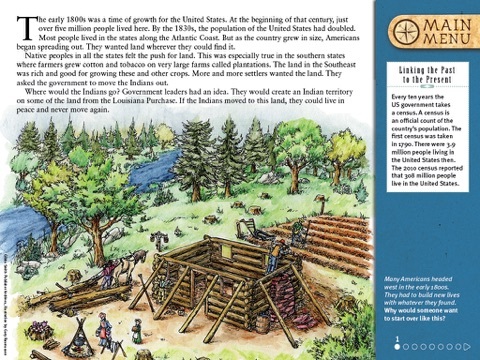 The actual set-up of the app allows children to swipe through the pages of information, however the lack of music, sound effects, or other narration can make it seem a bit dry for children to use. With that said, if teachers are choosing to use this app in the classroom, it could be a great way to allow children a new way to do some self-study.